General Contractor: Gordon-Kreuger Const. Co.
Set within the historic settlement area of Corpus Christi, the old Nueces County Courthouse is located on the original location designated as the courthouse block by the county commissioners in 1853. 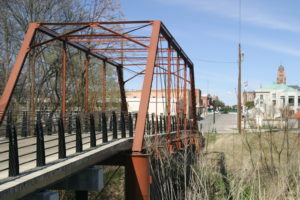 When the structure was built in 1914, it was located at the edge of downtown Corpus Christi and was surrounded mainly by residential housing. Today the courthouse is still adjoined by an old residential district to the north and east. However, to the west, at an elevation above the courthouse, is an expressway and to the south are parking lots. Designed by Harvey L. Page in 1913, the Classical Revival structure was originally a T-shaped building, but 1930 additions to the west have created a cruciform shape. Rising six stories above ground, the reinforced steel building is faced in soft gray brick with white classical terra cotta trim and is crowned by a red roof, originally of tile. The main (east) facade, facing the Bay, is reached by a broad flight of steps, raising the main entrance to the second level. This tall, narrow, projecting entrance wing is dominated by Tonic colonnade in antis flanked by brick pilasters, which support a classical entablature. Above the dentilled cornice are four basrelief, terra cotta figures separated by three square windows. A pediment, elaborated by terra cotta ornament and pierced by a circular window, along with a pedimented parapet, crown the classical facade. The dominant classical theme is again evident in the north and south wings. Containing only four stories, the wings are smaller in scale than the entrance pavilion. Varying from the main facade the wings contain pedimented bays on each of the three laces. Two of these facades, the entrance and east (side) elevations, display two, two-story Ionic columns, framed by brick pilasters at the second and third level, while on the west side the pedimented bay is marked only by the brick pilasters. Above the third floor is the encircling classical entablature, topped by fourth story windows, and the three crowning pediments. The south entrance is located at the ground-floor level. The central door is sheltered by a small pedimented porch roof supported by two carytids. The north wing also contains an entrance at the coursed basement level but it is relatively unadorned. In the early 1930’s a large six-story brick addition was made to the west facade. The addition uses identical building material and is surrounded by an entablature between the fourth and fifth levels. Although there is little ornamentation, the rear appears to be part of the original structure. In the 1960’s a large two-story addition was made to the building at the northeast corner. The design is inconsistent of the original architecture, but the use of the gray brick blends with the original building material. The most unfortunate additions have been the portable frame buildings, used as offices, which are scattered about the south lawn of the courthouse grounds. Present restoration plans for the courthouse include removing the 1960’s and 1970’s additions. The interior arrangement consists of a basement floor housing mechanical equipment, justice courts and some county offices. The second floor contains the county courtroom and the general offices of county officials. The three district courts encompass most of the third floor space, while more offices are arranged on the fourth floor. Contained in the top two floors are the jail facilities. Between the fourth and fifth floor the architect designed an air space containing insulation to sound proof the jail from the rest of the courthouse. 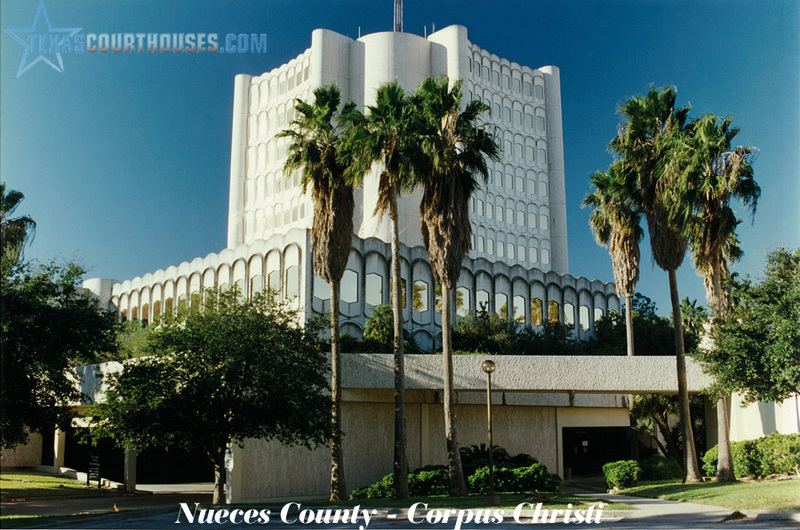 The Nueces County Courthouse is a six-story brick veneer structure located on the original courthouse block in Corpus Christi. The imposing Classical Revival structure, built in 1913-14, is the third courthouse and is historically significant as one of the oldest remaining buildings in the city. Because they have saved few of their historic structures, many Corpus Christi citizens see the preservation of the courthouse as an important first step in saving the few remaining 19th and early 20th century buildings within the area of old downtown Corpus Christi. The first permanent settler in the area was H. L. Kinney, who bought land near Corpus Christi and began ranching and trading. On the site of present Corpus Christi, he established Kinney’s Ranch and Trading Post. The place grew precariously until General Zachary Taylor’s army was stationed there in September, 1845. Kinney promoted the region and Corpus Christi became the county seat of the newly formed Nueces County in 1846. Nueces County, originally including the entire area south of Bexar County, west to the Rio Grande, and east to the Gulf of Mexico, was created from San Patricio County. After the town was incorporated in 1852, the county commissioners began making plans for a courthouse. H. L. Kinney sold to the county commissioners lots 4, 5, and 6 in the Courthouse Block, bounded by Belden, Mesquite, Aubrey and Broadway. In 1853 J. B. McCowan, contractor, began construction of an adobe and concrete structure that as to cost the county $4,000. When the project was not completed by August, 1854, the job was turned over to James McMartin and the structure was finally occupied in 1851. This original structure served the community until 1875 when a new courthouse of concrete was built on the same block at a cost of $15,000. At the beginning of the 20th century Nueces County still contained an area of 2,264 square miles with Corpus Christi as the county seat. In 1912 Jim Wells’ 791 square miles were organized into a county, and the next year Kleberg’s 698 square miles were carved out of Nueces County to leave it with its present boundaries and an area of 775 square miles. 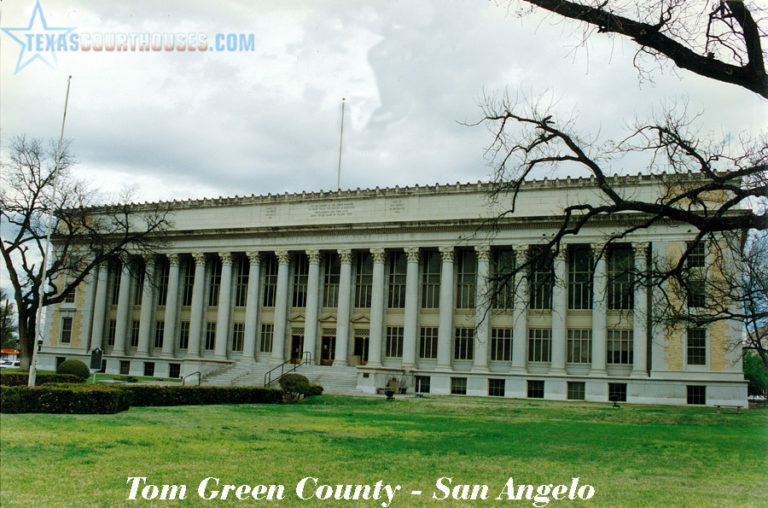 By this time the 1875 structure was inadequate to cope with the growth of the 20th century county government organization. Having voted bonds for a new building in July, 1913, Harvey L. Page of San Antonio was chosen as the architect. Page (1859-1934) had practiced architecture in Washington D.C. before moving to San Antonio in 1899. He designed the International and Great Northern Railroad in San Antonio and Laguna Gloria in Austin, both on the National Register. The remainder of the lots on the courthouse block had been acquired in the 1890’s and first decade of 20th century and the 1913-14 courthouse was built on this same block set aside in 1853 as the location of the courthouse. At a cost of $250,000, a new T-shaped Classical Revival building was constructed to house the new county government offices, the courtrooms and the jail on the upper two floors. Many people lived in the courthouse during the early 20th century and there were continual residents through the 1950’s. Jailers lived with their families in a separate apartment on the fifth floor, while other county officials lived, permanently or part-time, in small apartments on the fourth, third and second floors. An addition in the 1930’s gave the courthouse its present cross shape. Due to crowded conditions since World War II many county offices have been moved out of the courthouse into other buildings. In the late 1950’s the tax office was moved to Shoreline Boulevard near City Hall after a $2.7 million bond proposal to remodel the courthouse was defeated, 3-2. No serious attempts have been made to restore the courthouse since that time and in 1975 a bond election passed authorizing the building of a new structure. Besides governmental office space the courthouse has served as a refuge in many storms. It was a haven in the 1919 hurricane that almost leveled the city. As late as 1961, during Hurricane Carla, hundreds slept and ate in the old courthouse for days. County offices moved to the new courthouse in late 1976. Presently several local citizens are hoping to encourage adaptive use of the structure.